As the site becomes more generally damp with the showery weather at the moment, it’s beginning to look more complex. At the north-eastern end, there seem to be areas of what are either soils left over natural hollows in the underlying deposit or are archaeological features. Phil and Nigel are mattocking the ‘natural’ to see if it really is natural (it looks it); Frankie and Peter are tidying up the foundation trench for (7), which doesn’t yet have a context number; Tony is continuing to clean around (15); Mick and Laura are continuing to clean the farmyard surface, together with Owain; Mervyn and Philip are finishing their plan of it. I have updated the matrix (all of eighteen contexts so far!). It will no doubt become more complex before the week is out, assuming that we don’t lose all the weekend to the threatened bad weather. The supposed natural – which now has context number (17) – is producing no finds whatsoever and is looking more like solid chalk as it becomes deeper. I am completely convinced that it is the chalk bedrock. It’s been recorded and backfilled. There are signs of more features becoming visible underneath the cobbled yard surface, some of which look like pits. It is also apparent that ‘Mick’s pit’ has been under-dug on its north-western edge. Frankie has discovered some early post-medieval window glass incorporated into wall (7), apparently deliberately sealed beneath a pig’s foot and a tile above that. This sounds possibly like a superstitious practice – I’ll have to check to see if there is any evidence for it. As everything is becoming clean, we are waiting for plans to be able to progress, but we are still held up as we have only the one planning frame. People are moving on to finds processing as they run out of site work. Some of the possible features in the north-western corner of the site are turning out not to be features at all. It looks as if the removal of (9) was not thorough enough here, so that (15) has not been exposed properly. Tony is sorting this out. Interestingly, the finds from (15) that have been washed today do not appear to include any nineteenth- or twentieth-century material (apart from a sliver of roof tile that may be intrusive). It will be good to find out the date of coin: at the moment, I’m guessing that it will turn out to be a Georgian halfpenny. Tony certainly has something different in the north-western corner of the trench, where there is a deposit filling a shallow hollow. Whether its a genuine feature or something worn in the floor of the barn is currently open to question. Frankie’s potential feature underlying wall (7) is looking like a natural periglacial fissure filled with a sterile clayey sand, (19). The very orange colour made it look suspicious from the outset as it’s completely dehumified: it is certainly not an archaeological deposit of recent date, although it could be prehistoric, I suppose. 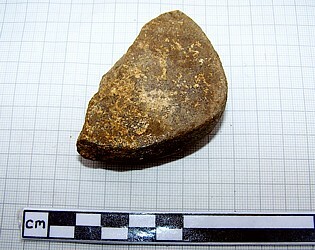 Towards the bottom, it produced a whetstone and a linen rubber, so it’s likely to be the fill of a prehistoric feature after all, which its irregular profile suggests may be Bronze or Early Iron Age. This is a really unexpected development that makes the absence of struck flint from the site all the more puzzling. The plan of the cobbled surface is now just about complete and we’ll have it done by the end of the day. I have assigned it context (20). Mervyn, Chris and Phil have done an excellent job with the plan and will no doubt be very pleased to have finished it. The surface is now photographed and ready to excavate tomorrow. All the finds excavated so far (with the exception of those from (19) and (21)) have been washed, so tomorrow we can sort those from (10) into material types. 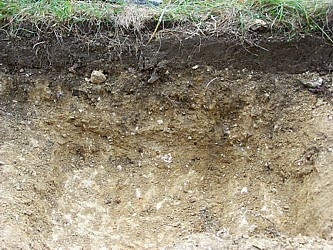 Posted on 17 August 2007, in Fieldwork, Norton Church Field Dig 2007. Bookmark the permalink. Leave a comment.